On occasion the school may have to close in case of an emergency or severe weather, although we would endeavour to send out a message via our usual text message system, you can also use the OpenCheck system- details are below. 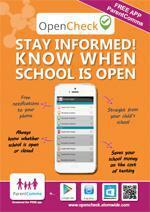 OpenCheck for Parents: OpenCheck allows you to check the status of our school on any given day. This easy-to-use service presents information regarding school closures in case of emergency, severe weather or any news which may affect children's ability to attend or access the school. The service is free to use* to both schools and parents, and can be accessed via the web or by telephone. OpenCheck is also available via ParentComms:Mobile as an app available for all popular smart phones, ensuring that Parents and Guardians have a choice of options on how to be kept up to date. Please use the drop down lists on the left side of the page to select Ealing and the Drayton Green Primary School.